Acinus – lung distal to terminal bronchiole. Spherical around 7mm in diameter. Respiratory bronchiole with some alveoli –> alveolar duct –> alveolus. Whole resp epithelium except vocal cords are covered by pseudostratified tall columnar ciliated epithelial cells. Mucus secreting goblet cells in cartilagenous airways. Neuroendocrine cells – seretonin, calcitonin, gastrin releasign peptide. Incomplete expansion or collapse of previously expanded lung. Reduces oxygenation and increases risk of infection. Pulmonary emboli originate from deep venous thromboses and are the most common form of thromboembolic disease. Fragmented thrombi from DVTs are carried through progressively larger veins and the right side of the heart before slamming into the pulmonary arterial vasculature. Most pulmonary emboli (60% to 80%) are clinically silent because they are small. With time they become organized and are incorporated into the vascular wall; in some cases organization of the thromboembolus leaves behind a delicate, bridging fibrous web. Sudden death, right heart failure (cor pulmonale), or car­ diovascular collapse occurs when emboli obstruct 60% or more of the pulmonary circulation. Embolic obstruction of medium­sized arteries with sub­ sequent vascular rupture can result in pulmonary hem­orrhage but usually does not cause pulmonary infarction. This is because the lung is supplied by both the pulmo­ nary arteries and the bronchial arteries, and the intact bronchial circulation is usually sufficient to perfuse the affected area. Understandably, if the bronchial arterial flow is compromised (e.g., by left­sided cardiac failure), infarction may occur. Embolic obstruction of small end­arteriolar pulmonary branches often does produce hemorrhage or infarction. Multiple emboli over time may cause pulmonary hyper­tension and right ventricular failure. Loss of elastic recoil of lung therefore reduced Expiratory flow. Of patients 10% are non smokers. Only a minority of smokers develop it. Emphysema – abnormal permanent enlargement of airspaces distal to the terminal bronchiole, associated wall destruction without fibrosis. Centriacinar (95%)- apical, in heavy smokers. protease-antiprotease theory – smoking causes inhibition of antiproteases therefore results in imbalance between proteases and elastases and their inhibitors leading to increased wall destruction. They also cause chemotaxis and cytokines cause further O2 free radical damage and increase macrophage elastase and metalloproteinases. So there is also an oxidant/antioxidant imbalance. Clinical manifestations start when 1/3 of parenchyma damaged. DYSPNOEA, weight loss, pursed lips, barrel chest. Secondary infections due to smoking intefering with cilliary function, leukocyte function and causing direct epithelial damage. Airway hypersensitivity(bronchospasm) and inflammation –> decreased airway diameter –> obstruction to flow. Chronic inflammatory disorder of airways causing recurrent wheezing, dyspnoea, chest tightness and cough. Eosinophils, IL4, IgE –> TH2 predominence. Late phase–> due to the chemotaxis there is a fresh round of mediator release and inflammation after the initial trigger has been removed. Morphology – mucus plugs, whorls of epithelium(Curschmann spirals), eosinophils, basement membrane thickening, oedema, inc size of submucosal glands, bronchial wall muscle hypertrophy. FVC – reduces in restrictive lung issues where lungs cannot inflate enough. Permanent Dilation of bronchi and bronchioles caused by destruction of muscle and elastic tissue resulting from or associated with chronic necrotising infections. Cx – fever, cough, myalgia, lethargy, SOB, respiratory failure, abscess, empyema, organisation, bacteraemic dissemination. Broncho pneumonia vs Lobar pneumonia. Influenza virus – single stranded RNA bound by nucleoprotein(determines if type a b or c). Lipid bilayer envelope with haemaglutanin and neuraminidase(determine subtype) – cleared by cytotoxic T cells and intracellular anti influenza protein in macrophages. Pandemics – antigeic Shift – recombination of RNA segments with animal viruses. Oropharyngeal surg, sinobronchial infections, dental sepsis and bronchiectasis, aspiration, antecedent bacterial infection, septic emboli, neoplasia can lead to it. Streptococci, Staph aureus, GN bacteria, mixed infections. 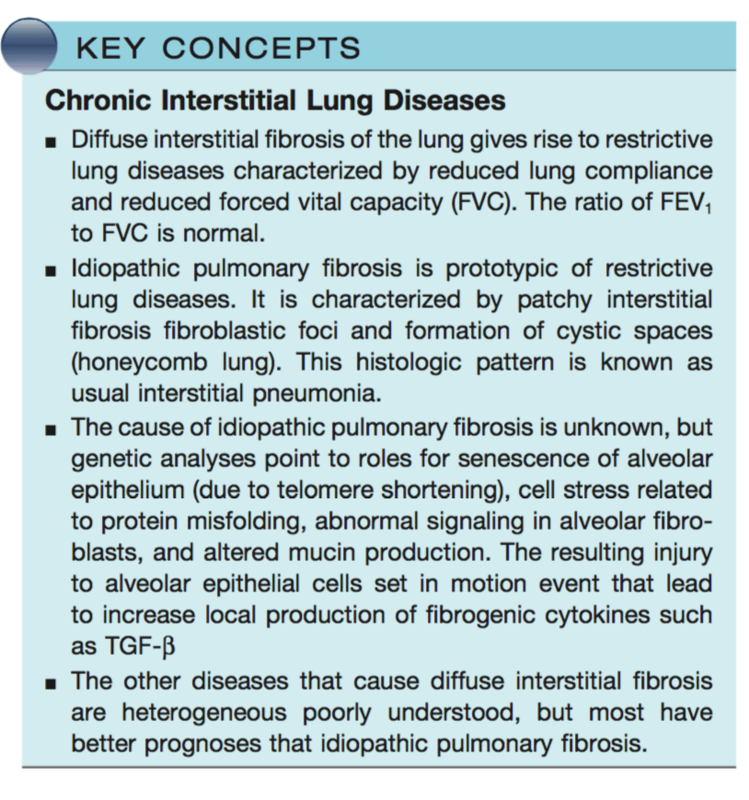 Chronic interstitial pulmonary diseases are a hetero- geneous group of disorders characterized predominantly by inflammation and fibrosis of the pulmonary interstitium. In general, the clinical and pulmonary functional changes are those of restrictive lung disease. Patients have dyspnea, tachypnea, end-inspiratory crackles, and even- tual cyanosis, without wheezing or other evidence of airway obstruction. The classic functional abnormalities are reductions in diffusion capacity, lung volume, and lung compliance. Chest radiographs show bilateral lesions that take the form of small nodules, irregular lines, or ground- glass shadows, all corresponding to areas of interstitial fibrosis. Eventually, secondary pulmonary hypertension and right-sided heart failure associated with cor pulmonale may result. Although the entities can often be distinguished in the early stages, the advanced forms are hard to differ- entiate because all result in scarring and gross destruction of the lung, often referred to as end-stage lung or honeycomb lung. Smokers, all are high grade, highly malignant, major bronchi and periphery, metastasise widely. Asbestos alone increases lung cancer rate by 5, with smoking it increases to 55 fold. Asbestos increases mesothelioma to 1000 times but not increased by smoking. What is ARDS and what conditions can cause it? Tell me about the pathogenesis and types of emphysema. Tell me about the pathogenesis of chronic bronchitis. Discuss asthma and its pathogenisis. What types of pneumonia are there ? What are the stages of lobar pneumonia ? Tell me about pulmonary TB. Tell me about the causes of interstitial lung disease. Discuss the classification, morphology of lung tumors.